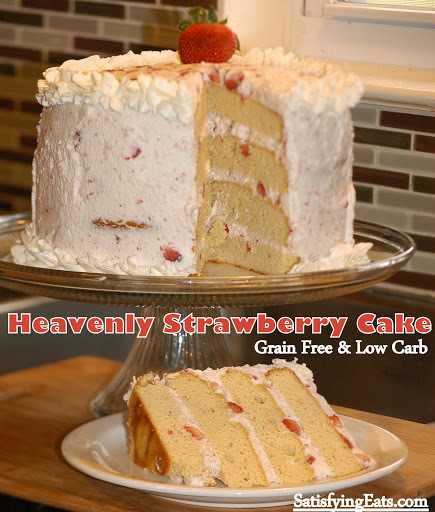 HEAVENLY is the only word that describes a Strawberry Cake, made with Fresh Strawberries! The original version of this cake (sugary and grainy) was my first birthday cake when I moved to Baton Rouge over 9 years ago. It was DELICIOUS and something memorable! This week I attended a birthday party where Ambrosia’s Strawberry Cake was the center of attention and I normally don’t have to use much will power to resist cake but I did that night! So what do you do when you can’t have someone else’s cake??? You create your own version! 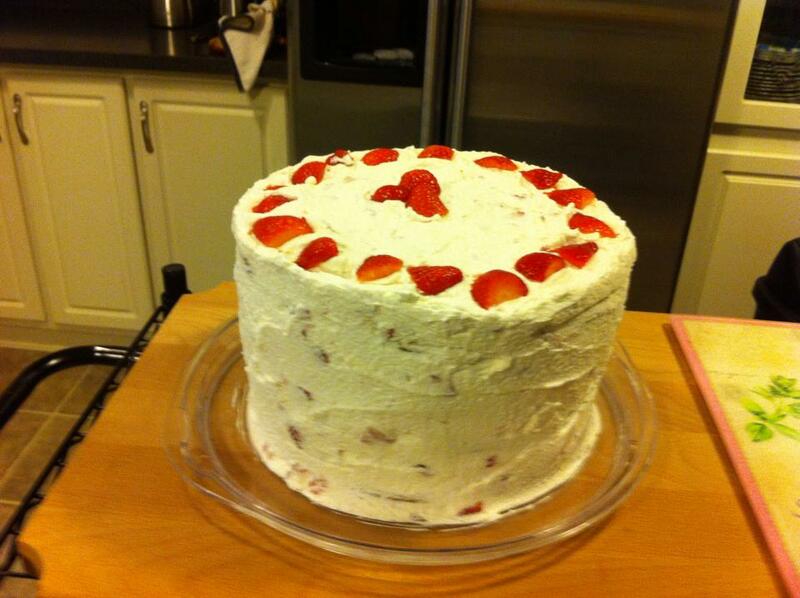 It turned out great and even looks like Ambrosia’s Strawberry Cake! I used (2) 8″ cake pans, then split the 2 cakes in half to make the cake 4 layers and high. By splitting the cake, this also helps make the cake more level when frosting. This was the most level 4 layer cake I have ever made! The dairy’s used in the cake can be changed around. The first one I made I used only sour cream and almond milk (2 cups sour cream and 1/2 cup almond milk) and it turned out great. The second one I made, I used the amounts of dairy specified in the recipe. You can also use part coconut milk. This cake can be made dairy free by using coconut oil and a combo of almond milk and coconut milk. It will have a slightly coconut flavor but I think coconut goes well with strawberries! Taste your cake batter before baking!! Stevia’s sweetness sometimes cooks out a bit so put a tablespoon of prepared batter in a cupcake liner and microwave (one of the few times I advocate using them) for 20-30 seconds. Taste. This will be sweetness of final cake. Add more sweetener if necessary! Also doing be afraid to taste frosting. I use a small amount of coconut sugar to “finish” sweetening this cake. Check out a past blog post that explains why I use real sugar vs. the artificial stuff. Use what sweetener you feel comfortable with. The recipe however is not adapted to use all honey but part honey would be fine. Again, TASTE YOUR BATTER! If using Stevia, start with less and taste. You can always add more but you can’t take away. Too much will cause bitterness but the right amount will not. The key to the constancy of the frosting is the unflavored gelatin. I used Great Lakes Brand (the kind in the orange container) that does NOT need to be dissolved first. Check out THIS blog post to read about the benefits of Great Lakes Gelatin! This is the only gelatin that I tried. I have no doubts that other kinds would work. If you do use another gelatin that has to be dissolved check out these instructions. This cake is HUGE!! The dome of my cake plate would not fit on top of it so I simply covered it with 2 large pieces of plastic wrap! It taste better after 4 hours or over night in the refrigerator. If you don’t want to make a cake that serves 20, simply half the recipe! Use one 8″ pan still so the cooking time will remain the same. You could also make this recipe into cupcakes. Use large scoop and portion into cupcake liners and bake for 16-20 minutes. 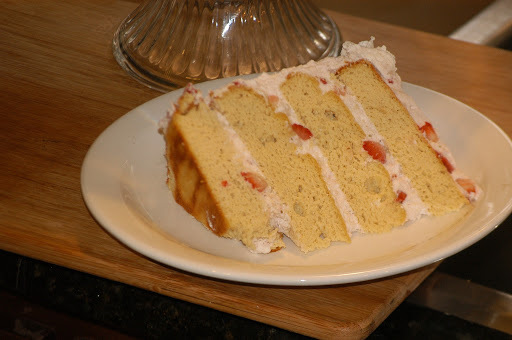 If the cake is still not sweet enough once you go to eat it, simply serve with additional sliced strawberries. The sweetness of the frosting will also depend on the sweetness of your strawberries! If possible, by fresh and buy local! For more pink frosting, puree additional strawberries and fold it into the frosting. If you like this recipe, be sure to check out my Cookbook, available on Amazon! Over 260 Grain-Free & Low-Carb Recipes! Preheat oven to 350 degrees F. Line (2) 8″ cake pans with parchment paper and set a side. Mix dry ingredients in medium bowl. In separate bowl, beat eggs and mix in remaining wet ingredients. Add wet to dry and whisk until there are no lumps. TASTE BATTER and adjust sweetness if needed. Divide into 2 lined cake pans. Each pan will have approximately 3 cups of batter. Bake for 40-50 minutes or until cake is brown on the top. Don’t under bake. Before removing from pan, use knife and go around the edges of cake in the pan. Carefully remove cake and cool completely on wire rack before frosting. While cake is cooking, prepare frosting. 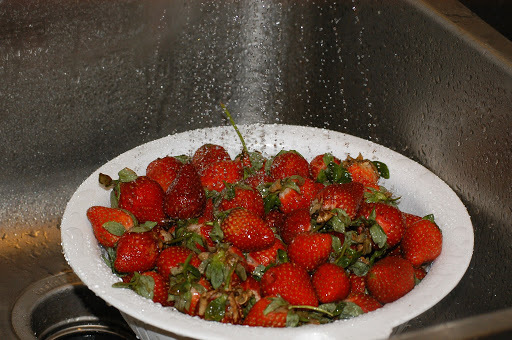 Finely chop strawberries. Be sure you have created some juice to color the frosting. In large mixing bowl, add heavy whipping cream, stevia and vanilla. Blend for 30 seconds and add gelatin while beaters are running, being sure to dust the gelatin over the cream and not put it all in one place. Continue to beat until cream has formed stiff peaks. This will take just a few minutes and when it does start to become stiff, it happens fast. Remove 1 heaping cup of whipped cream to use for piping (optional). Fold in strawberries and stir well. Taste for sweetness and adjust to your likeness. Once cake has completely cooled, using long serrated knife, carefully split cake horizontally, creating 4 cakes from 2. Check out THIS link for instructions on how to easily split a cake. Place 1 cake onto cake plate (I also used an 8″ cake board). 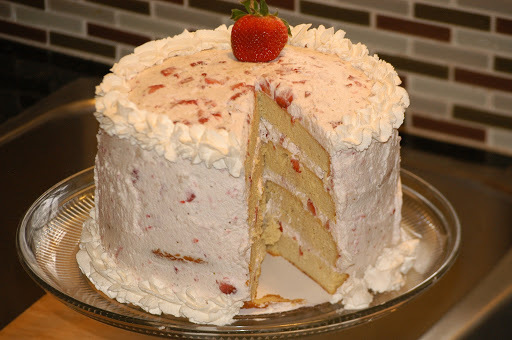 Top cake with heaping 1 cup of strawberry frosting and spread to edges. Repeat this 3 more times. 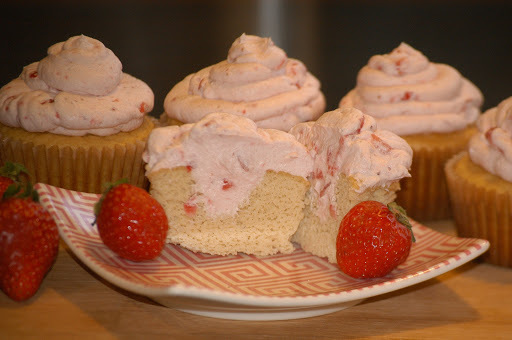 After all 4 layers have been stacked and frosted, use remaining strawberry frosting to frost sides. For final piping, using a star tip and a piping bag (or quart size storage bag), pipe the reserved plain heavy whipping cream around the bottom and top. Refrigerate at least 4 hours before serving. Enjoy! By clicking on any of links in my blog, you are helping me continue doing what I LOVE to do! Also, when purchasing items from Amazon, consider clicking on THIS affiliate link. Anything you purchase within 24 hours after clicking on THIS link, I will receive a small commission as well.Thanks again for all of your support, it is greatly appreciated! More great recipes to come! Hi!I've been trying for long to find a recipe for a low-carb birthday cake and I think I found it. This looks delicious!Have a nice day! Hi Melissa! 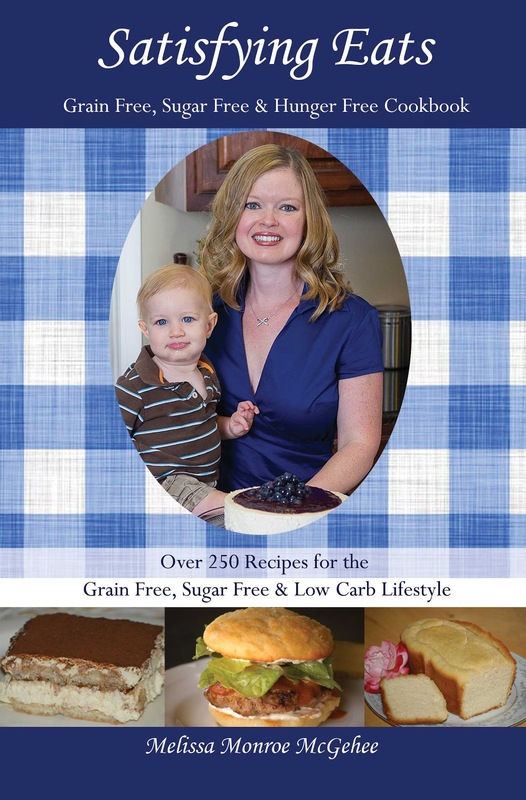 I am a new follower after reading Wheat Belly and finding some of your recipes on pinterest! I am so excited to find such great recipes! I have actually already purchased your eBook and make the cheddar biscuits tonite! I waited anxiously for hubbys reaction……..he Loved them! Woohoo! And he is a picky eater ;). I do have one question from your cookbook on your homemade Mayo……. In the past, I got salmonella from eating raw eggs (tasting cake batter) so I am very nervous to eat them. Do you have any suggestions?. Thx so much for what you do! Substitutes – half and half for whipped cream and Greek yogurt for sour cream. I love this recipe . I want to make cupcakes for my daughter birthday . Can I substitute coconut sugar only instead of stevia . And how much should I use. Thank you for great cake ! Made this today and it WAS, indeed heavenly. Only one problem/complaint….the cake lid doesn’t fit over it. LOL Kidding. It’s perfect! Could I sub Swerve instead for the sweetener? Yes Tina you can. Just be sure to sweeten to taste, your taste that is.